This weekend, my husband and I hosted a baby shower for my brother and sister-in-law, who are expecting a little girl soon. This is the first baby in our immediate family, so we’re all diving head-first into the deep sea of baby apparel, gifts, necessities and do-dads. Through this process, I found a few local hotspots for baby bump bearers, trendy tots and mod moms. My top pick has to be Best for Babies in Silverton. They have everything from chic diaper bags (as pictured above) to the cutest toys and books. The company also keeps a well-updated blog and Facebook page, so link up with those to stay on top of everything new and adorable in baby land. 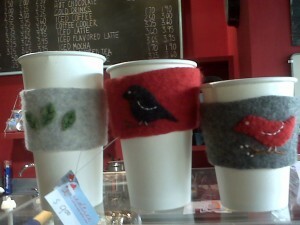 My second local favorite is for the shower host or gift buyer. I stumbled upon the “Diaper Cakes & Such” Web site via Twitter, and I fell in love! 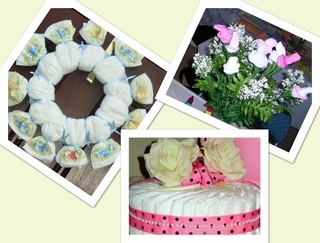 A local lady designs and develops these unique creations – mainly “cakes” and wreaths – made completely out of diapers. The best thing? Each of the creations can be disassembled and actually used! (Diapers are expensive, so you don’t want to waste them!) With a stop to Michaels Craft Store, you can easily make your own if you have the time and creativity, but – with all the time and creativity it took just planning the shower – I sure didn’t! One of the things that could have saved me some extra time was doing my shower invites on Shutterfly. I found this super-easy baby announcement card creator page a few days after my hand-made cards went out (doh!) so I’m hoping this discovery helps you instead! 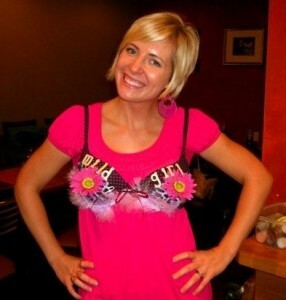 Show Your “Support” For Bras with Flair! I remember my mom used to always tuck my bra strap back up under my tank top or sleeves and say, “It’s not polite to have your bra showing in public.” Well, next Wednesday my mom will be witness to hundreds of bras – we’re estimating about 300 at this point – “showing in public” as they bedazzle Fountain Square. Cincy Chic will collect all donations and have them on display for the Bras with Flair on the Square event on Fountain Square, Wednesday, Sept. 30 at the following times: 7-9 a.m., 11 a.m.-1 p.m. and 4-7 p.m. Attendees and passersby can visit the booths, sign up for a mammogram, get in the Lexus RiverCenter “Cash Cab” to win prizes and also cast their vote for their favorite bra. The top 10 favorite bras will be up for auction – to benefit Susan G. Komen For the Cure – at the after party from 7-10 p.m. at the Hilton Netherland Plaza where you can enjoy “Ta-Ta-Tinis” and food specials. From 12-1 p.m. on Sept. 30, a free bra fitting lunch ‘n’ learn will take place at the Cincinnati USA Regional Chamber. La Silhouette Lingerie Owner, Britt Cruikshank, will offer advice, expert bra fittings and certified post-surgical fittings for all attendees. E-mail RSVP@cincychic.com or call (513) 721-2445 to reserve your spot! Later that afternoon, a fashion show featuring the latest fall trends from Alligator Purse and Cincy Designer Shoes will be on the Square at 6:30pm. Click here to purchase tickets to the fashion show – 100% of the proceeds go to Susan G. Komen For the Cure! Watch the below video for a sneak peak of the fashion show! Last but not least… Cincy Chic and Locals on Living, an affiliate of the Cincinnati.Com network, partnered to provide one local breast cancer survivor with a $3,000 pamper package thanks to Lexus RiverCenter, Tuscany Spa.Salon, La Silhouette Lingerie, Cincinnati Playhouse In The Park, Fusion Studio, Soho Boutique, Pure Romance and Jeff Ruby’s Steakhouse. Cast your vote today and find out who wins at the fashion show!